Did you know that coconut oil is a superfood? Did you know that it is a healthy fat? I have been researching coconut oil for some time and decided to start eating it myself daily 6 months ago. This article explains why it is so good for you and what can happen if you include it in your diet. There is absolutely NO evidence that coconut oil contributes or creates heart disease. In fact all the research says that it actually protects the heart from disease. So now I have got that off my chest (no pun intended) I can explain why this is so. The biology is complicated but I have tried to simplify it so it is easy to understand. Fats come in three types: short, medium and long-chain fatty acids. Animal fats in meat and animal products are long-chain. Coconut oil is a mixture of mostly medium (and some short chain) fatty acids. Many of the health benefits of coconut oil are due to the way coconut oil is digested. This process also means that it can aid weightloss very effectively. More on that later but first let me explain the background….. The digestion of Coconut Oil is Different! Our bodies digest fats in different ways according to the size of the chain. Eat a meal containing animal fats such as cheese or meat and the long chain fatty acids require digestion by pancreatic digestive enzymes. They are then absorped through the gut wall as something called lipoproteins and in that form start circulating in the blood stream. It is while they are circulating that they can be deposited as fat in fat cells and form plaque in our arteries. With coconut oil however, the medium chain fatty acids are already broken down by the time they get to our gut, and so do not need the pancreatic enzymes. They are absorbed through the gut wall and instead of circulating around like the long chain animal fatty acids, they go straight to the liver and are used as a fuel source. They do not have the same lipoprotein stage as long chain fats which is one of the crucially important differences. If you are familiar with my story you will already know that I had cancer of the lymphatic system when I was 18. The treatment I received at that time was extremely high dose radiotherapy and as the cancer was located in my neck and torso, so my thyroid gland received a huge blast, and has been struggling to cope since. I actually experienced an energy surge (not usual with an underactive thyroid gland)! 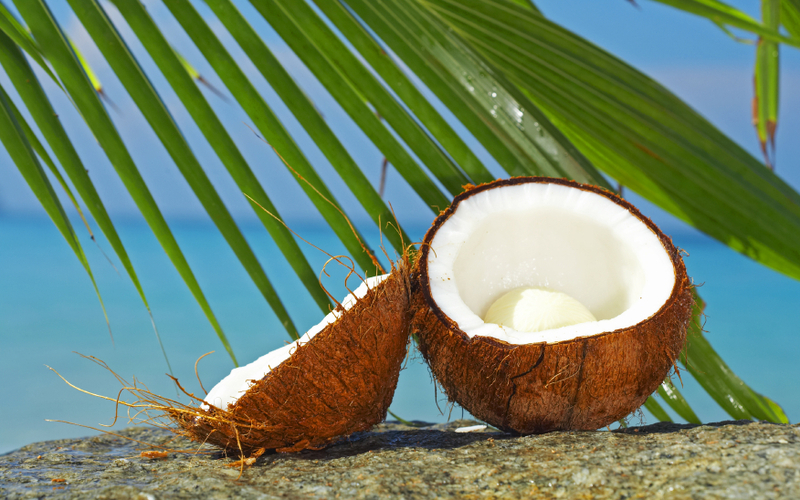 So How does coconut oil contribute to weight loss? The benefits do not end there! Research has shown repeatedly that coconut oil destroys invading pathogens. The monoluarin substance in coconut oil deactivates bacteria, fungi and viruses by disrupting the workings of their lipid membranes. So you can see that the health benefits of coconut oils are massive. So what else is important about coconuts? Coconut water that comes from young coconuts is the most natural isotonic drink. (Isotonic means it has the same concentration as our blood and cells in the body). I conducted a recent experiment on my partner and son who ran the world’s largest fun run of 14km in Sydney this month called the City to Surf. I stood waiting for them on a very long and steep hill commonly referred to as “heartbreak Hill” (you can guess why) in order to give them some coconut water. After drinking it as they ran they both reported an amazing difference in their muscles and energy levels that was quite remarkable shaving 8 minutes off their race time! You can see from the length of this post that the health benefits of coconut oil are numerous and considerable. Isn’t it about time that you started including it in your diet? Happy Health and Homeopathic prescribing!